WAILUKU — The Royal Canadian Navy crew members could have spent their day off at the beach — instead, they chose to come to Hospice Maui to help clear the property and deliver a $10,000 check to the Wailuku nonprofit. 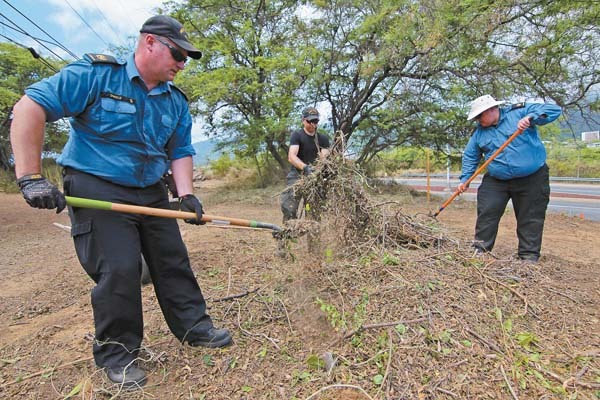 About 25 crew members of the HMCS Ottawa hacked away shrubbery, laid flagstones and dug up haole koa and kiawe trees around the 4-acre property to make way for a meditation garden and improve safety for drivers. Based off Esquimalt, British Columbia, on Vancouver Island, the HMCS Ottawa is a 442.8-foot-long Halifax-class frigate with 225 crew members. The ship arrived on Oahu last month for Rim of the Pacific Exercise 2018 (RIMPAC), the largest international maritime warfare exercise in the world. After sailing to Guam, the ship stopped by Maui and will later head to Southern California for LA Fleet Week, explained Sub-Lt. Matthew Mooney, public affairs officer for the HMCS Ottawa. Navy Lt. Andrew Klinger said when he found out the ship would be visiting Maui, he began looking up local palliative care facilities, which serve patients facing serious and life-threatening illnesses. Ordinary Seaman Casey Moore represents his home country while clearing brush in front of Hospice Maui on Sunday morning. Klinger, a chaplain known to the crew as “Padre,” lost his 6-month-old son to Zellweger syndrome in 2005. During the six months of his son’s life, Klinger lived in a palliative care facility. “As soon as I found out we were coming here, it was important to reach out into the community and see what was available,” Klinger said. Facilities like Hospice Maui provide “the necessary space for families to contemplate and move through the stages of guilt in advance of losing a loved one, and to do it in a very supportive environment,” he added. LaGoy said Hospice Maui has about 65 full- and part-time employees and usually serves more than 70 patients at a time — most in their own homes. The facility also has five beds reserved for the sickest patients. HMCS Ottawa crew members clean up the hillside next to the Hospice Maui driveway. Dr. Greg LaGoy, chief executive officer of Hospice Maui, said this will provide better visibility for drivers turning onto Mahalani Street. 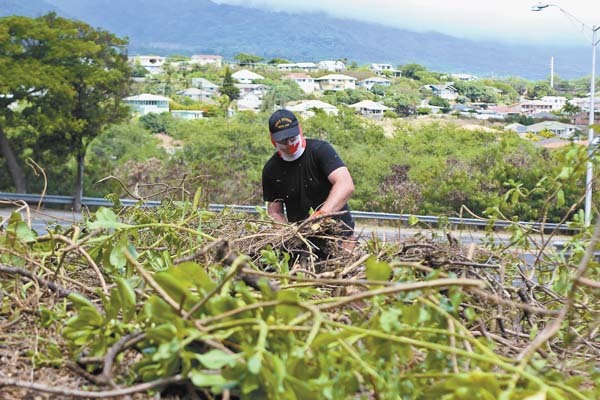 On Sunday morning, armed with chain saws, hoes, pruning shears and machetes, crew members hacked away at the tangled shrubbery covering the hillside next to the bottom of Hospice Maui’s driveway Sunday morning. LaGoy explained that the overgrown shrubbery blocked the view of cars turning onto Mahalani Street. “So now there’s going to be improved visibility at the intersection, and we’re going to maintain it so it’s going to stay that way,” he said. Navy Sub-Lt. Matt Mooney (from left) and Lt. Andrew Klinger present a $10,000 check to Dr. Greg LaGoy, Hospice Maui’s chief executive officer, on behalf of Boomer’s Legacy, a Canadian organization that supports humanitarian efforts in honor of Cpl. Andrew “Boomer” Eykelenboom, a Canadian Armed Forces medic killed by a suicide bomber on Aug. 11, 2006. 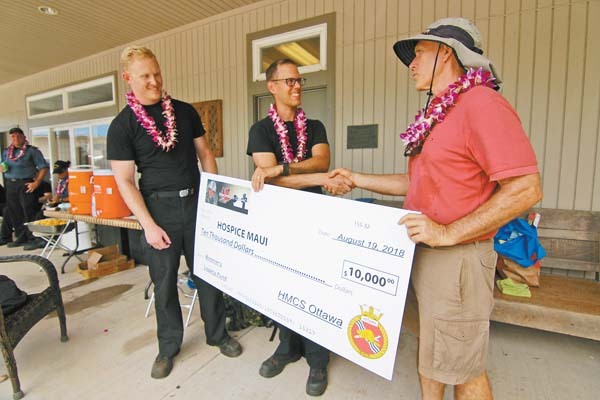 On Sunday, the crew also delivered a $10,000 check to Hospice Maui on behalf of Boomer’s Legacy, a Canadian organization that supports humanitarian causes in honor of Cpl. Andrew “Boomer”Eykelenboom, a Canadian Armed Forces medic killed by a suicide bomber in Afghanistan on Aug. 11, 2006. LaGoy said the donation will go toward much-needed security lighting in the parking lot. Since Hospice Maui can’t run power lines in certain areas, the lights will be photovoltaic. After a morning of hard work Sunday, crew members all received a lei and lunch. “We do it for the pretty flower necklaces,” Navy Lt. Alanna Foscarini joked after getting a plumeria lei from Hospice staff. 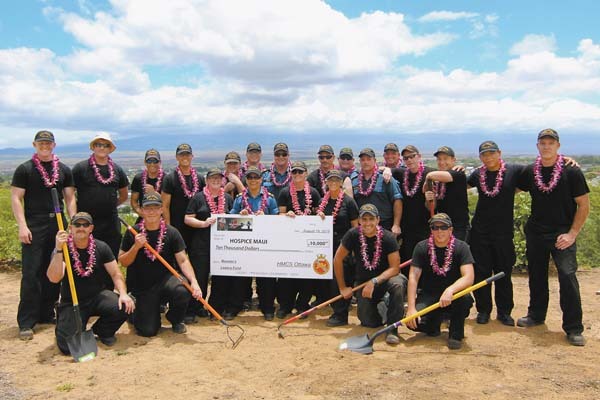 Members of the HMCS Ottawa pose with the $10,000 Boomer’s Legacy check after a morning of hard work on Hospice Maui’s 4-acre property in Wailuku. Mooney said the appreciation from staff “makes the sweat and little bit of blood and maybe a sunburn or two” all worth it.